Most people know Vorshlag for our automotive suspension solutions, but we've also been in the V8 swap market for over a decade. 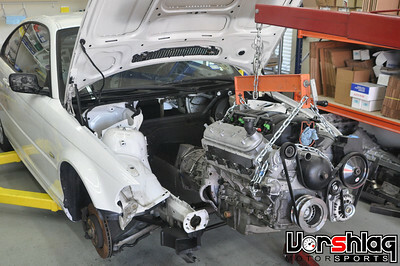 We put the first LS1 V8 into a BMW back in 2002. Doing work in our own and friends' home garages our first BMW E36 LS1 V8 swap was completed in 2005, even before Vorshlag was incorporated into a real business. 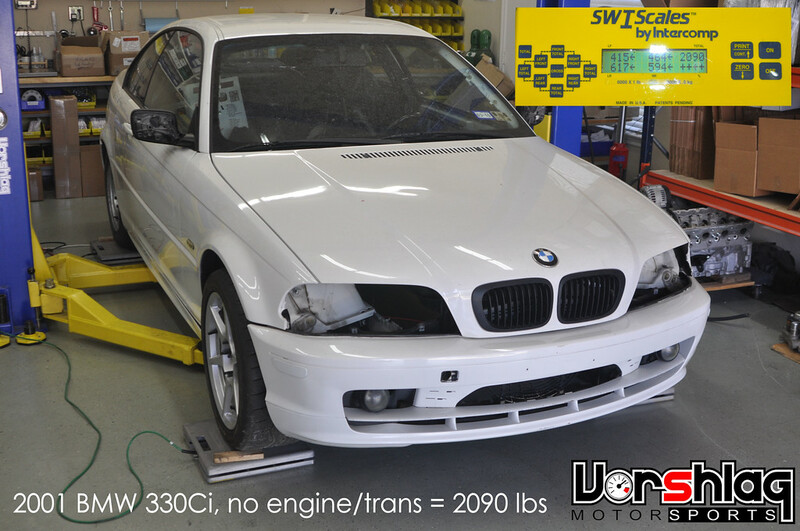 By 2007 we had E36 LS1 production swap parts available and have been developing more BMW LS1 solutions ever since. 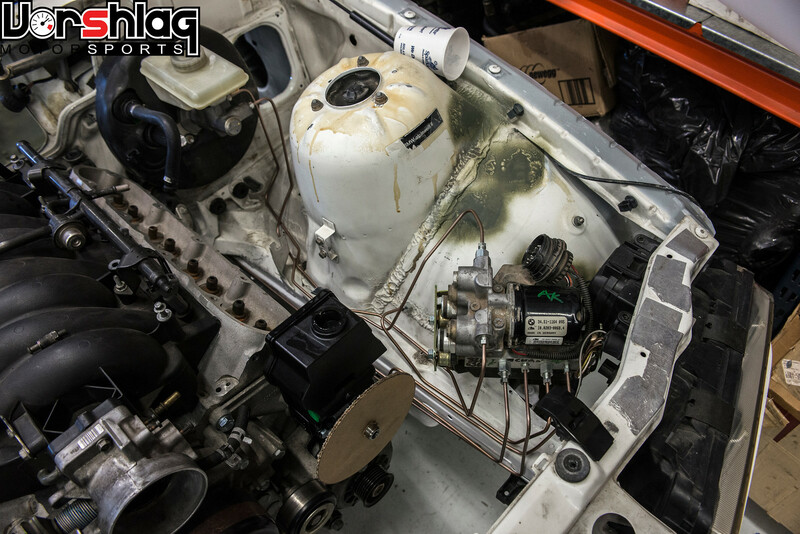 We have even completed E30 LS1 swaps, like the one for a magazine shootout we won in 2011, but that engine install just wasn't feasible as a bolt-in exercise like the E36 (we will do one-off, turn key E30 LSx swaps though). The E36 and Z3 swaps have been the bulk of our LS1 swap business since 2007, but we are expanding that now, so this new "broad based LS1 swap" forum announcement thread makes sense. I will update this thread whenever we have any new products to offer for the various LS1 swaps we support, instead of burying new product releases in our various project build threads, like I did previously. Initially we got a lot of flak from BMW purists for doing these "bastardized" domestic V8 swaps into fine German sports cars. But after so many kits have been built, more and more people have ridden in or driven an LS1 V8 powered BMW E36 - and as we've seen, one test drive quickly turns disdain into desire. It helped when BMW themselves put V8 engines into their own E46 M3 GTR race cars, then into all production E92 M3s, implying that our V8 swap wasn't such a crazy idea. With GM LSx engines being made since 1997 in production numbers in the "tens of millions", these compact, lightweight, plentiful and powerful engines have become THE go-to engine for hot rodders, racers and street enthusiasts alike. 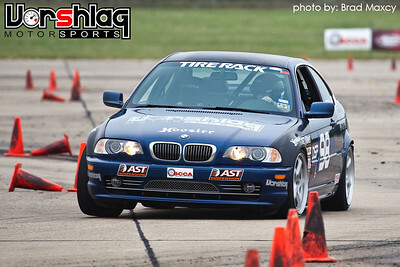 LS1 BMWs are great on track, in autocrosses, and on the street. We've sold nearly 80 kits since 2007, with many happy customers in both street driven and race car E36 LS1 builds. Our "Stage 0" kit has always been a popular foundation for these swaps. This includes the main parts needed to get the drivetrain into the chassis: custom motor mounts, transmission crossmember, full length exhaust headers, steering shaft, and driveshaft. The Stage 0 was the first kit we released but we have made additional parts available over the years. 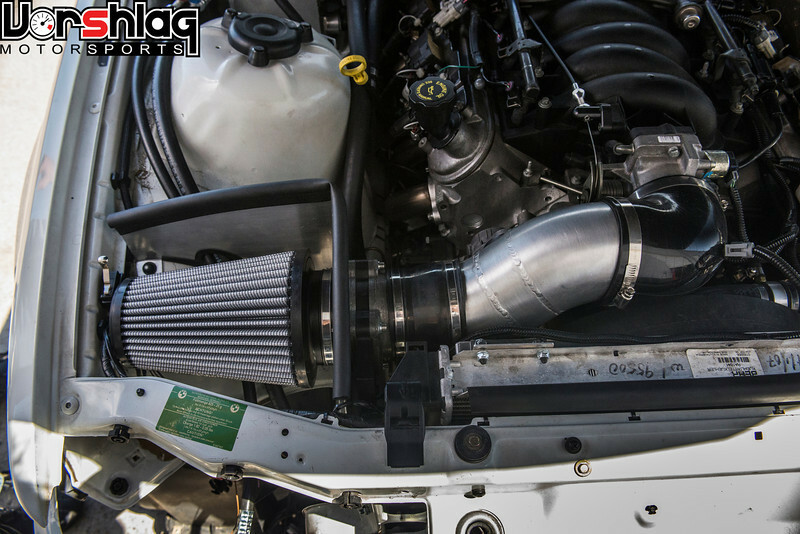 As Vorshlag has grown we have brought our fabrication and development work in-house, and over the past 12 months we introduced many new sub-system solutions for the E36 LS1 swap. This added to the already extensive list of E36 LS1 swap parts we make. E36 Stage 0 Kit - Includes headers, motor mounts, transmission crossmember, steering shaft and driveshaft (which can all be purchased separately). 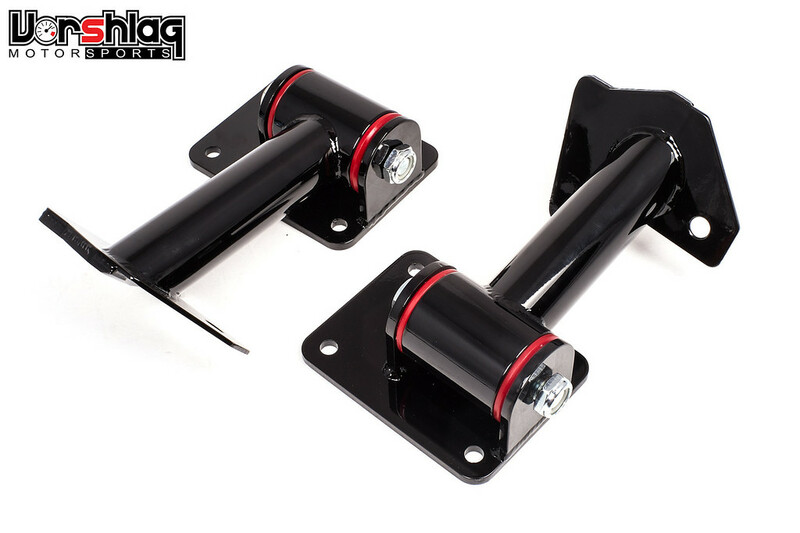 E36 LS1 Motor Mount Kit - Custom fabricated motor mount assemblies with polyurethane bushings and all necessary mounting hardware. 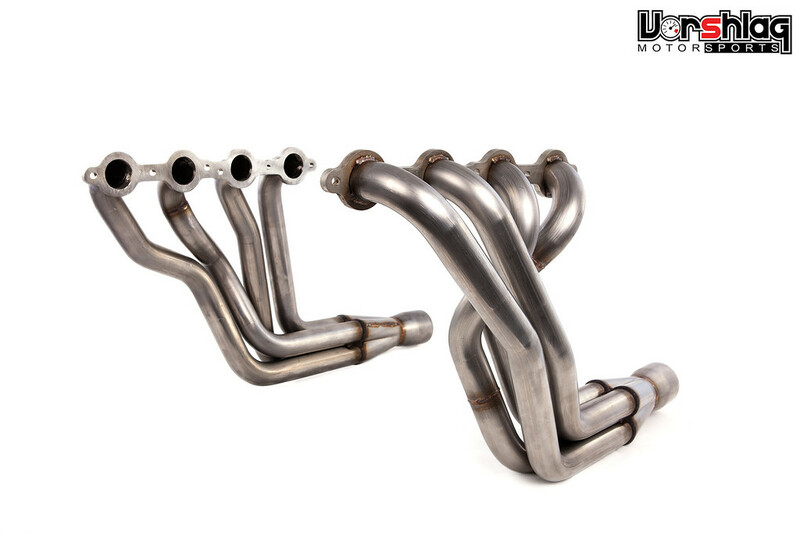 E36 LS1 Full Length Exhaust Headers - Developed by Vorshlag, these American made, 304 stainless full length headers are CNC bent using 1-3/4" diameter primaries and 3" collectors. Kit includes U.S.-made stainless V-bands and O2 bungs. 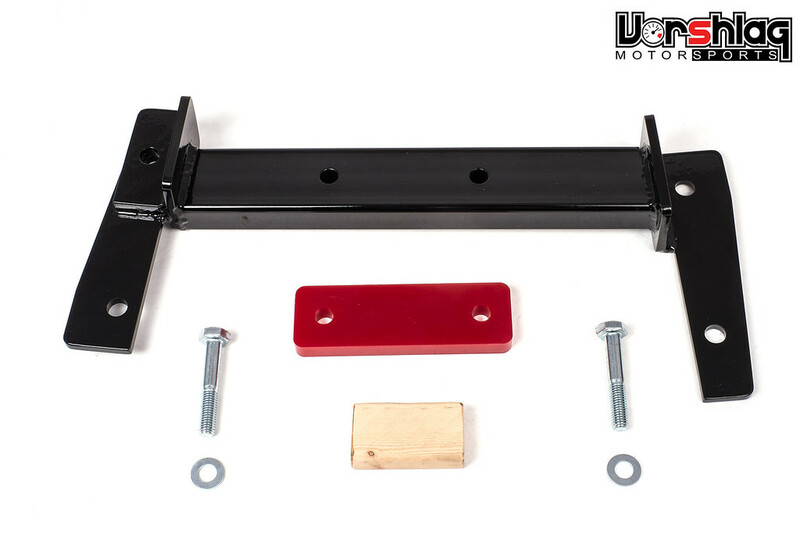 E36 T56 Transmission Crossmember Kit - Available with Nylon or new Polyurethane mount bushing. E36 T56 Driveshaft - We make these for the E36 chassis and the Z3 chassis, in variations for the Tremec T56 and T56 Magnum (TR-6060). Comes with Nylon or Polyurethane mount bushing. E36 Competition Steering Shaft Assembly - We make this to add clearance and heat protection around the exhaust headers, in both E36 and Z3 lengths. E36 ABS Pump Relocation Bracket Kit - This bracket comes in two variations (3 channel and 4 channel) to relocate the ABS pump for header clearance. E36 LS1 4-Channel Brake Hard Line Kit - The 1996-99 M3 version is out and the 1996-98 328 version is coming soon. 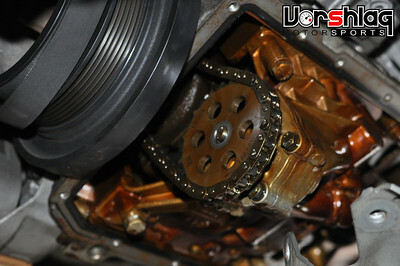 E36 LS1 3-Channel Brake Hard Line Kit - The 1992-95 non-M and M3 version which uses 3-channel ABS. E36 T56 Hydraulic Throw Out Bearing Kit (w/ remote bleeder) - We take a new hydraulic TOB, add a remote bleed line and a line to connect to the E36 firewall connection (using braided stainless Teflon lines). 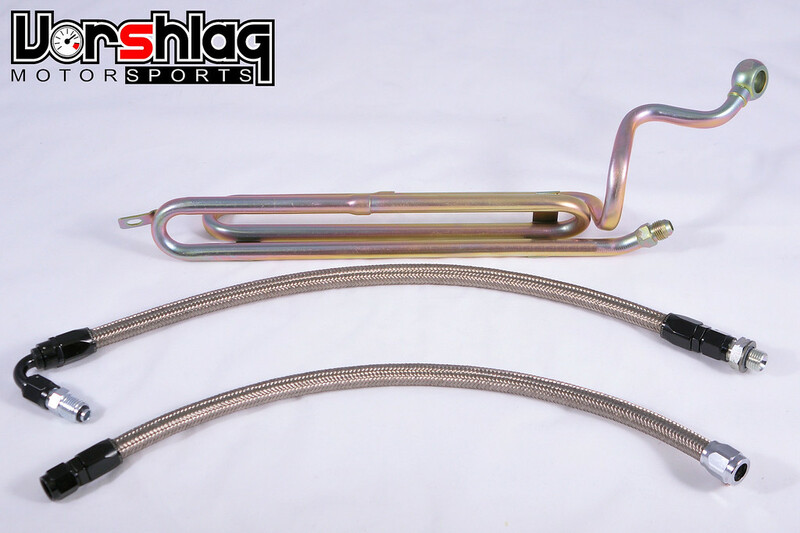 E36 LS1 Fuel Line Kit - This is a complete kit to plumb fuel from the E36 fuel tank all the way to an LS1 fuel rail. E36 LS1 255 lph Drop In Fuel Pump Kit - This drop in kit includes a new high flow fuel pump, wiring, internal fuel line, and proper clamps. It comes in two styles for your E36 (early and late housings, aka: tan vs blue). 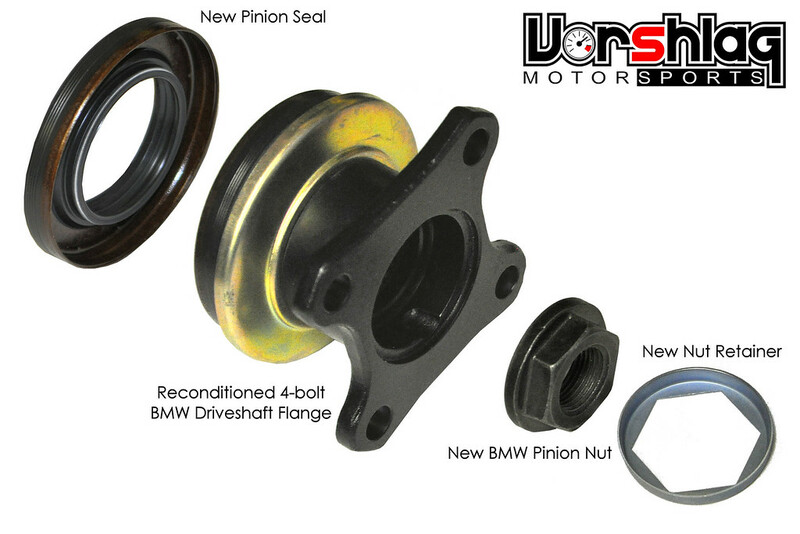 E36 Axle Drive Flange Conversion Kit - Convert the 6-bolt axle flanges found on some 1995 M3's to a 4-bolt flange. 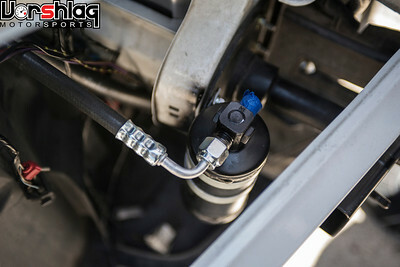 E36 LS1 Power Steering Hose Kit - This completes the power steering hydraulics, mating the LS1 pump to the E36 rack, including a new loop cooler and AN braided lines. E36 LS1 Stand-Alone Wiring Harness - In it's third revision, and coming soon to production! E36 LS1 Cooling System Kit - We've made several iterations and it is also nearing production release! 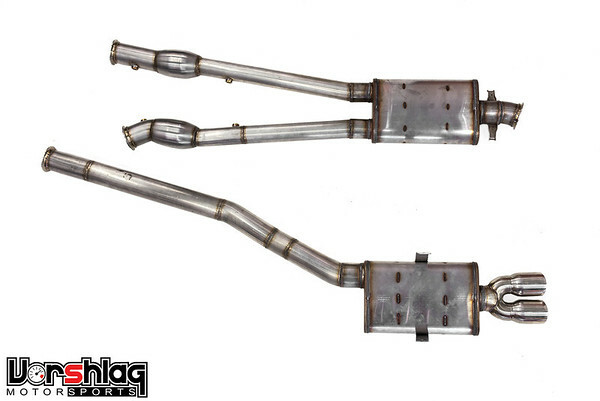 E36 LS1 After-Header Exhaust - We will be offering these soon. 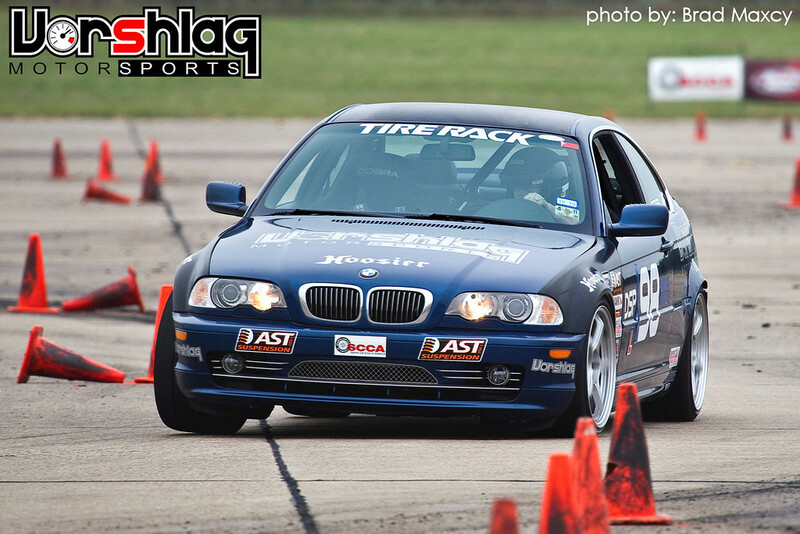 Introducing the Vorshlag E46 LS1 Swap Kit! At long last, Vorshlag is ready to introduce our first round of E46 LS1 swap components. Our E46 V8 swap design began almost two years ago, and there were lengthy delays along the line, but we finally have most of the Stage 0 parts available in production form and in stock now. We finished the production fixtures for the mounts and crossmember and made our first batch in late June/July 2013. The first batch of production headers has arrived and they look and fit great! 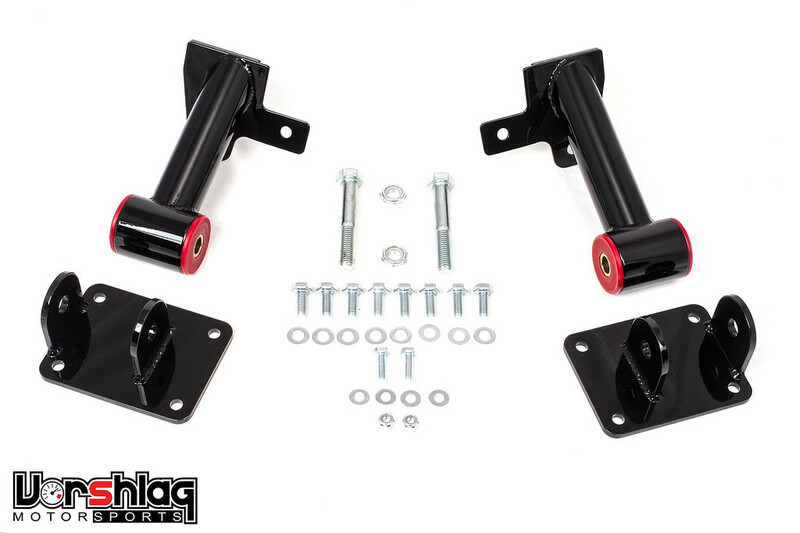 E46 LS1 Motor Mount Assembly Kit - Custom fabricated motor mount assemblies with polyurethane bushings and all necessary mounting hardware. 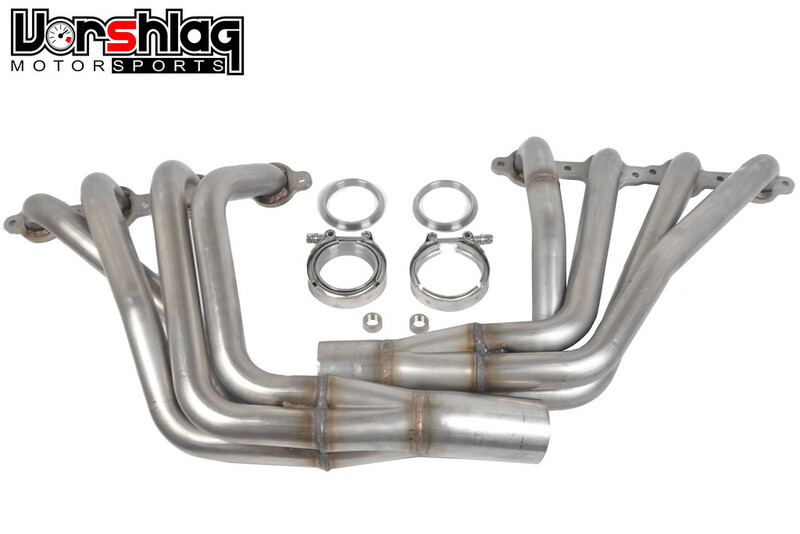 E46 LS1 Full Length Header Kit, 304SS - Developed by Vorshlag, these American made, 304 stainless full length headers are CNC bent using 1-3/4" diameter primaries and 3" collectors. Kit includes U.S.-made stainless V-bands and O2 bungs. E46 T56 Transmission Crossmember Kit - We make these for the E46 in variations for the Tremec T56 and T56 Magnum (TR-6060). Comes with Nylon or Polyurethane mount bushing. 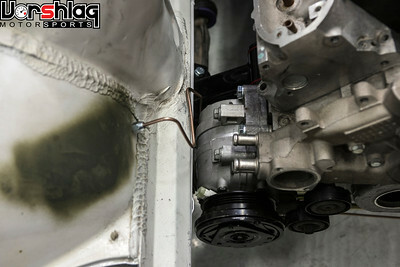 E46 Competition Steering Shaft Assembly - We make this to add clearance and heat protection around the exhaust headers. 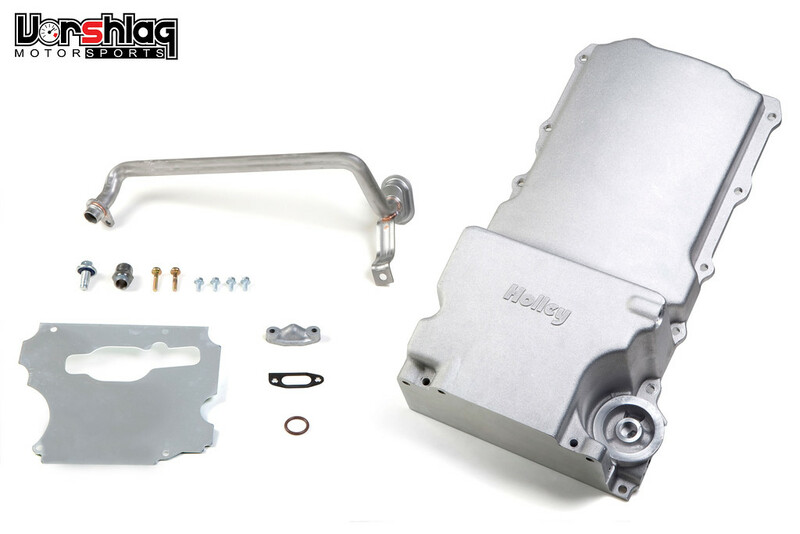 Holley LSx Oil Pan Kit for BMW E46 LSx Swap - We built our E46 LS1 swap kit using this oil pan, after trying many others. 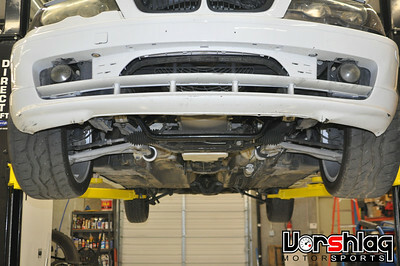 This is the best fit around the E46 front crossmember and it is needed for the swap. We wasted three years trying to make an M54 powered BMW perform. Blew up two motors, too. Never again. The E46 chassis is finally becoming affordable in used form and we have had too much pressure from customers to not develop this V8 swap kit. Why? Because people are getting tired of the HUGE repair bills when they overheat or blow up factory BMW E46 motors. We've broken a number of E46 motors ourselves, too (see above). I've gone on record saying that the M54 motor (the E46 330's aluminum 3L DOHC straight six) is one of the worst performing, fragile, and expensive engines on the planet, and I stand behind that statement. The non-M motors just don't make much power (the 330 ZHP motor was rated at a whopping 235 hp), and while the S54 makes 333 hp in the M3, they don't make much torque (and cost a FORTUNE to repair or upgrade). All of them are hard to add more than about 20% power over stock, without resorting to expensive boosted solutions - that then become too fragile for track abuse. It is a no-win situation. An all aluminum, 400-500 hp, naturally aspirated LSx V8 is the ultimate fix for the big and expensive engines that come in these cars from the factory. Yes, some people get offended when I talk disparagingly about BMW engines, but I ask you - why? Did you make the darn thing? No? Then don't get offended - it is just a machine. These straight six BMW engines really are more fragile, expensive to upgrade/repair, and under-performing when you compare them to many other make/model engines in the same price range. There's also a reason why BMW went to a V8 in the E92 M3 and twin turbos in the 335 and 135/1M. The days of a high winding straight six being the top performing engine at BMW are in the distant past. Long Live the V8! So, that's my sales pitch and reasoning behind the E46 LS1 swap. It just... makes sense, makes more power, and damn sure makes for a more fun to drive car. Now let me answer the questions that we know will arise 1000 times a week after people hear that "the Vorshlag kit is out". I am saying this now: we have the first round of parts, but this is not a 100% complete, ready to bolt-in V8 swap kit just yet. Please read this list below before asking your questions. Thanks! No, we do not have everything you need for an E46 LS1 swap, yet. This is a much newer development than our more mature E36 LS1 swap. While we would love to have everything ever needed for these swaps on Day 1, that just isn't how we launch our V8 swap products. 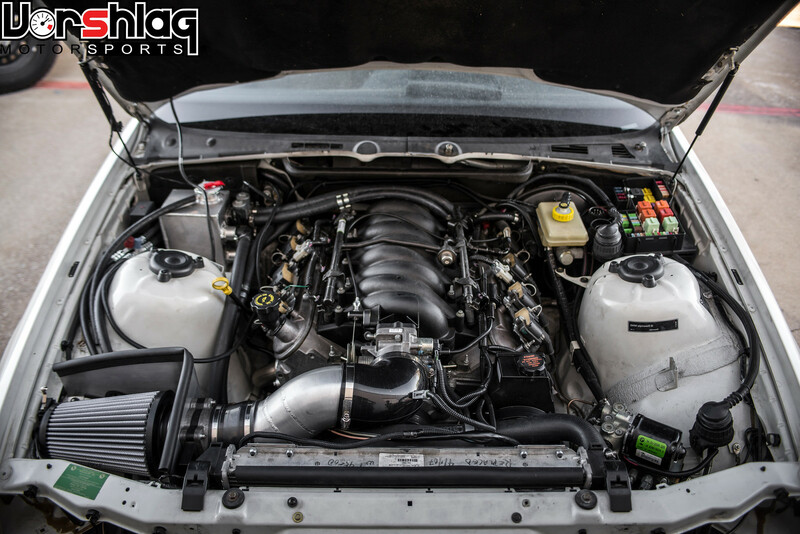 Many of the early adopters would rather get these E46 LS1 drivetrain mounting and exhaust parts and delve into their projects NOW rather than wait 1-2 years for everything to be fully developed at Vorshlag for a near bolt-in solution. We don't have hours estimates, total project cost estimates, engines for sale, or anything beyond what we have listed above for the E46 LS1 swap at the moment. 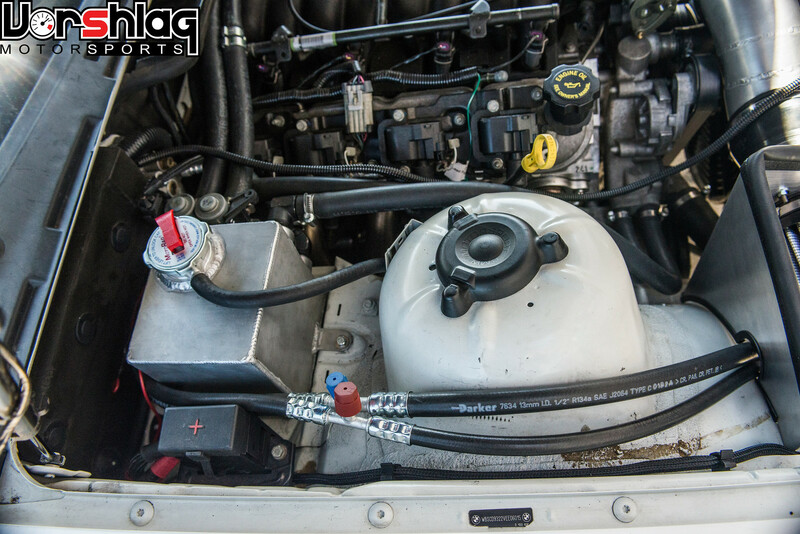 No, there is no "wiring harness solution" for this E46 swap available from Vorshlag, yet. Yes, we know about the various one-off E46 LS1 builds that are on the internet forums, and the several CAN-BUS wiring solutions they have come up with. We are looking at and in some cases talking to these folks, but we do not have any wiring harness for sale for the E46 at this time. It isn't nearly as easy as the wiring on the E36 chassis, but it is possible and we will pursue it. 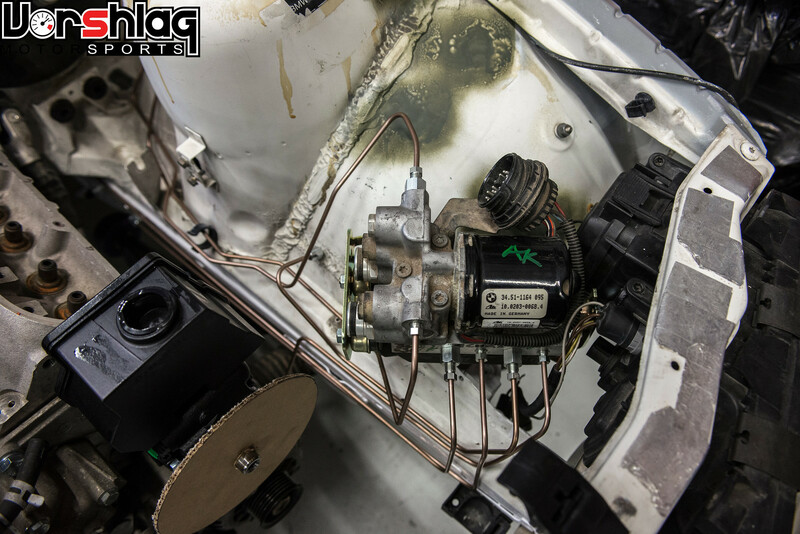 We will start developing our CAN-BUS friendly wiring solution towards the end of Q4 2013 (we're swamped with in-house turn key E36 LS1 swaps and other service work at the moment). Our "Alpha" E46 LS1 build is going to be more race car than street car, and it will not use the factory gauges, air conditioning, etc. 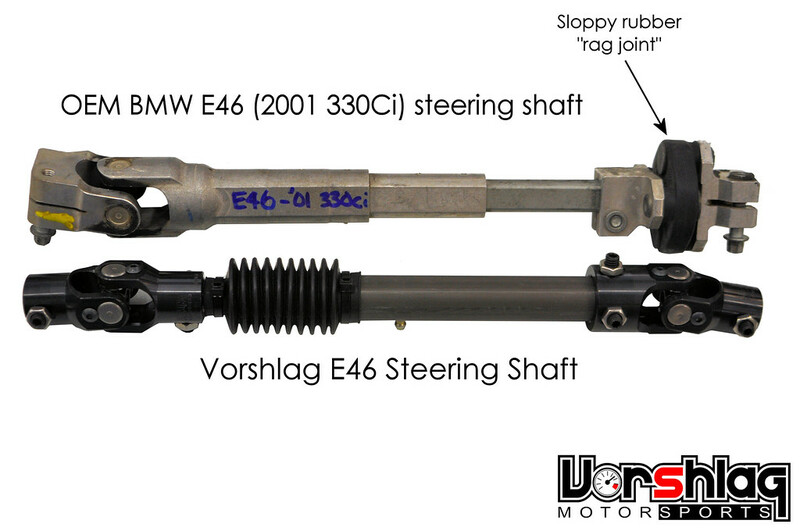 The next parts we will have for the E46 swap are driveshaft options (with variations to connect to the E46 non-M, E46 M3 and Ford 8.8" IRS differentials), which will complete our E46 "Stage 0" kit. We have switched suppliers and the new driveshafts look VERY NICE and come from a well proven company. 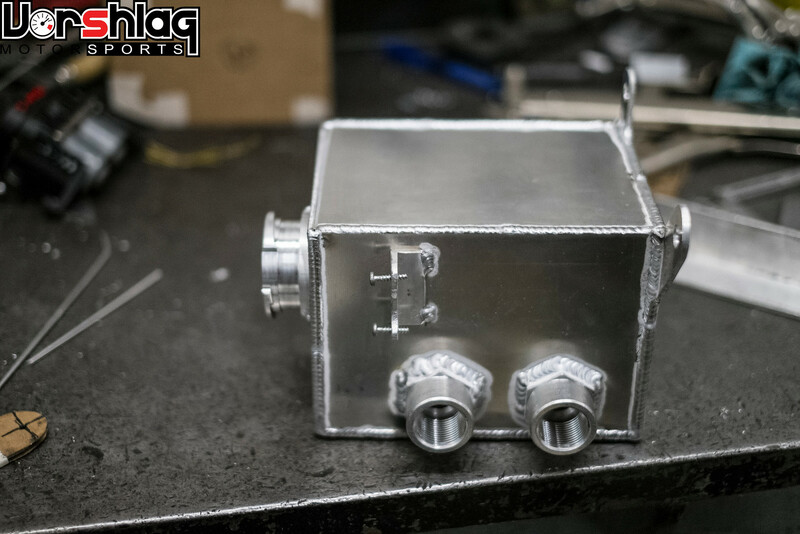 Since aftermarket gearing and aftermarket differential upgrades are so heinously expensive for the E46 factory diff housings, we are going to develop our own 8.8" Ford aluminum IRS center section swap - and no, we don't have any pricing or ETA yet, but we have parts on hand and this development is underway. Stay tuned, as we will announce any milestones in this thread. We have also not mapped out all of the chassis, ABS, wiring and other differences between all E46 platforms. These cars came to North America in many 6 cylinder versions including: 323, 325, 328, 330, and M3, with 2 doors, 4 doors and wagon models. As we do more swaps, we will surely find some variations needed in sub-system parts, as we have on the E36 chassis. None of our kits are made for Right Hand Drive models, Ti models or 4 cylinder cars that didn't come to North America. 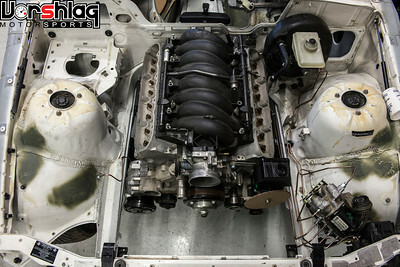 Sorry RHD guys, almost nothing from our kits will fit your cars. We are not supporting a CARB-friendly V8 swap (nobody does). Sorry to our California-based fans. Title your cars in another state, or move to an area with more rational emissions laws, heh. You west coasters get all of the beautiful beaches and weather anyway. And all of the fires and earthquakes, too. Lucky! For those of you who pre-ordered E46 LS1 swap parts, we have called you and started shipping parts today. Anyone else, please feel free to e-mail us at info@vorshlag.com for more questions. Please first try e-mailing us about V8 swaps, and we can resort to phone calls if your questions get complicated. As we add more products to either the E36 or E46 LS1 swaps, I will update them in this thread. Also, feel free to check out our Alpha E46 LS1 swap project thread, in-house E36 LS1 swaps, and our Alpha Miata LS1 swap threads, all of which are located here. My E46 kit parts shipped today. It will be Xmas in July when they arrive! As a non-mechanic, I'm trying to make the process as simple as possible for myself, while still having the gratification of "doing it yourself"
Very interested in the wiring harness for the e36 LS1 swap as well. This is my only hesitation and the moment and a PnP wiring solution will really help. Really looking forward to the A/C lines. Drop in A/C lines would save a lot of calling around to A/C shops and hopefully look much better than building my own. Love the "techy way" comment. Along with everyone here, just trying to add my bit to the engine conversion knowlege base. what is the piping size for this exhaust? Dual 3" into a single 3". We have done dual 3" into single 3.5" but it gets tight back there. And LOUD. when is the exhaust going to be available? is there any performance downside to the dual 3" to single 3"? How about an E46 parts update ... I'm running low on popcorn and my accountant is trying to appropriate my highway trust funds! We make these to order now and have built 3 more sets in the last month. We revised the design for better clearance and now it uses dual 2.5" into a 3" rear section, and there is no loss of power but additional ground clearance. These LS1 exhaust systems sell for $1675 as shown below. We can build them with the standard Magnaflow mufflers (as shown in the previous pictures/post) or the new MagnaFlow XL 3-chamber mufflers, shown here. We've added a V-band in the middle to make the system break down for easier shipment. The system is 100% 304 stainless with mandrel bends, Magnaflow cats, and US-made stainless V-bands and O2 bungs. It is beautiful... fits beautiful, sounds beautiful... I will post some sound clips soon. The rear tips are custom double walled and angled to fit the M3 rear fascia. 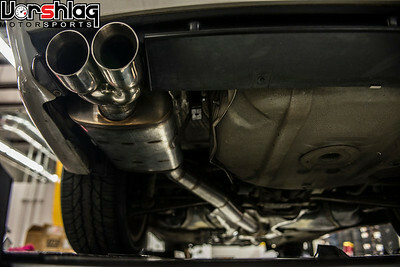 We include new BMW sourced exhaust hangers and custom mounts. 100% complete, made for our E36 LS1 headers. Each system takes from 12-14 hours to fabricate, and each is custom built using one of the many E36 LS1 swap chassis being built at our shop. That's our new E36 LS1 coolant reservoir and heater control valve mount. This replaces the plastic radiator mounted reservoir and relocates the heater control valve, includes the OEM float sensor, and is made at Vorshlag. Will have more details on this soon. 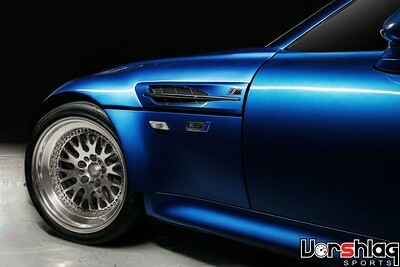 What going on with the e46 products .. Any .. MORE .. e46 LSx chassis / engine adaptation products ready soon Terry? suspension .. complete exhaust .. 8.8 diff .. etc ? Can we get an update please ! Some sweet gear here, any updates for the Aussie RHD crew? I'm dead keen to start this project. Last month they said "we have asked our local importer for a RHD front clip to develop the RHD parts, but have not received it yet"
Last edited by Chris289; 04-09-2014 at 11:08 AM. 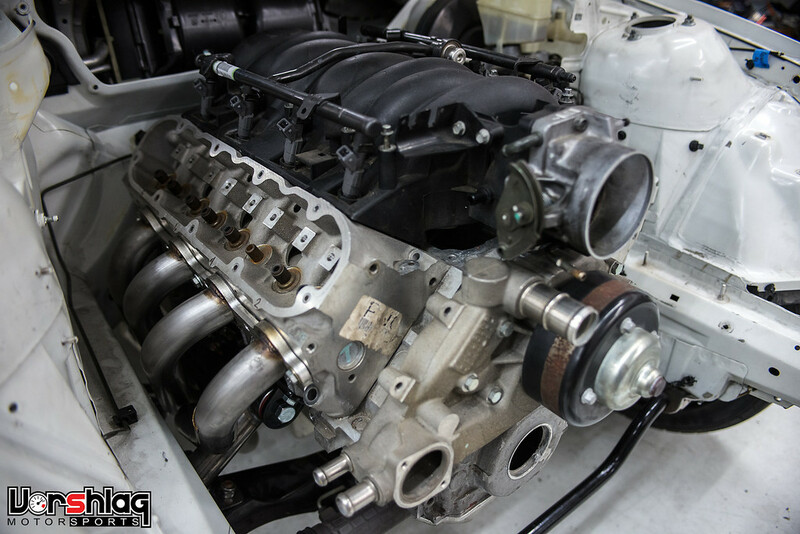 Updates for April 9, 2014: We have knocked out a lot of new bits and pieces on some customer E36 LS1 swap turn-key builds. This work has led to new solutions for more complete sub-system kits that we have added for this chassis, including some parts that are coming soon. 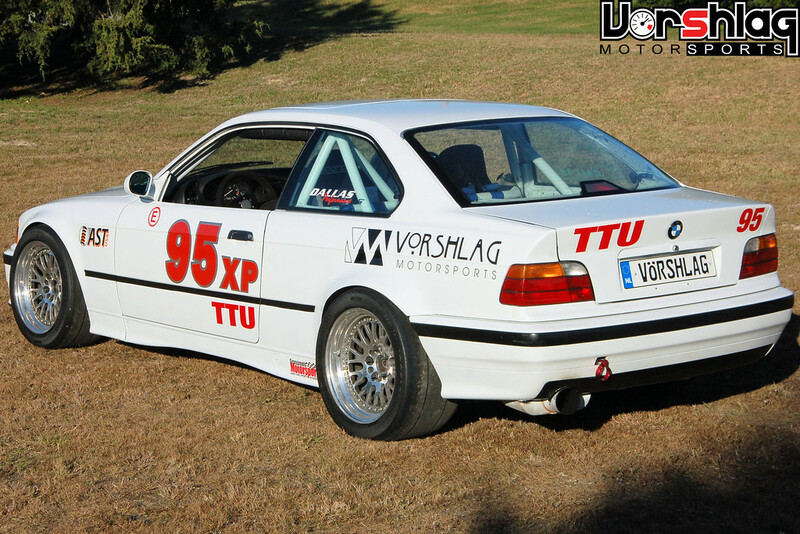 Vorshlag has now sold over 85 LS1 swap kits for the E36 chassis and we hope to hit 100 kits by summer 2014. We will keep developing more parts solutions to make this the easiest bolt-in install for a V8 swap on the market. The white M3 above has many of our newest parts installed: cold air kit, ABS brake hard lines for a 4 chanel M3, A/C kit, engine wiring harness kit, ABS wiring extension harness, electric fan and shroud, remote coolant reservoir, and full street exhaust system. This shows the latest revision of our cold air kit we are developing and will release soon. This will include a washable air filter similar to the one above, 3.5" aluminum intake tubing fabricated and welded in-house, and the silicone throttle body 90° elbow as shown. 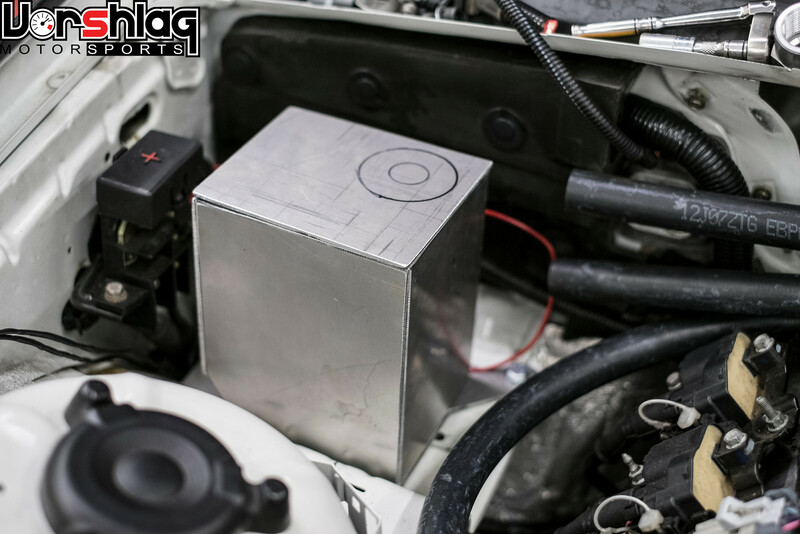 A heat shield fabricated from sheet aluminum will have a sealed upper surface to keep hot engine air from getting to the intake filter as well. We should have more of these produced and available on our website soon. Vorshlag can build you a complete street-car exhaust systems starting at $1699 + shipping. These 304 stainless exhaust systems are dual 2.5" into a single 3" main pipe, built to order from header flange to exhaust tip. 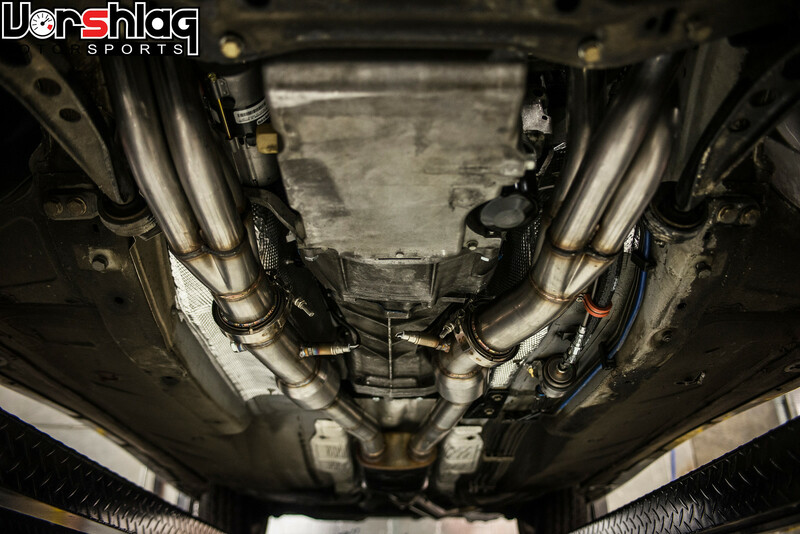 Made in-house from U.S. sourced 304SS mandrel bends, two Magnaflow mufflers, two Magnaflow catalytic converters, exhaust hangers, stainless V-band flanges and everything needed to attach it to your E36 chassis with a Vorshlag Stage 0 kit (our headers and mounts). Fits 2 and 4 door E36 chassis. Please call our shop to order, then allow 2-6 weeks for in-house manufacture and delivery. Remote coolant reservoir, heater control valve mount and heater hose kit for E36 LS1. 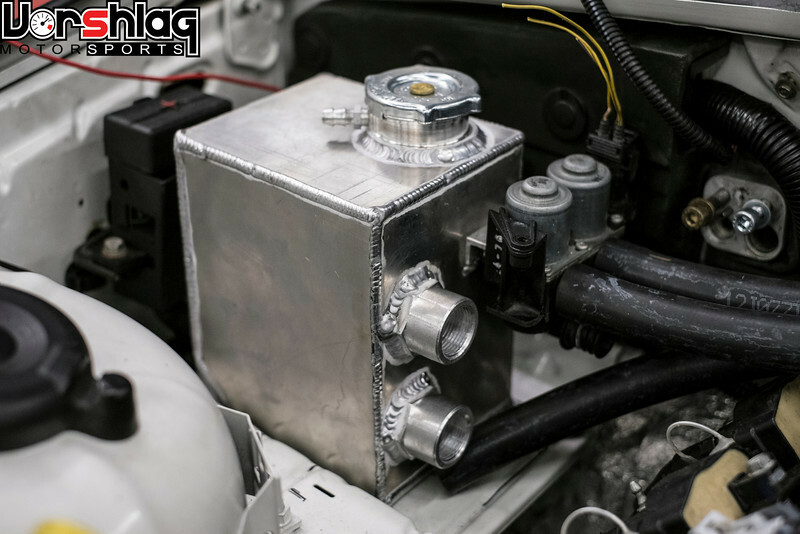 Removes the plastic OEM coolant reservoir tank normally mounted to the radiator and moves a more robust fabricated aluminum tank to the right rear corner of the engine bay. This relocation of the reservoir allows for more room at the front of the motor and utilizes a normally unused corner of the underhood area. This provides a stable mount to relocated the heater control valve, where two heater hoses split into three branches at the firewall. 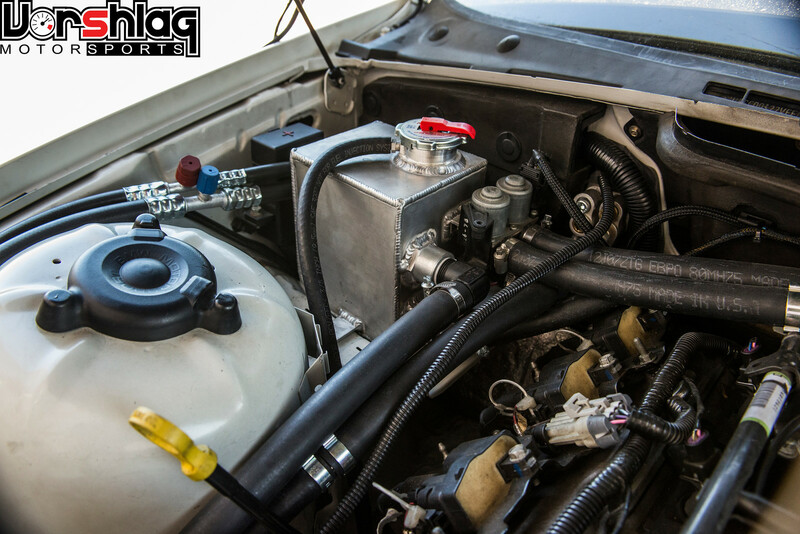 Includes a radiator cap (16 psi) and a provision to mount the factory coolant level sensor in the bottom of this tank. This reservoir bolts into existing holes in the E36 chassis; no cutting or drilling needed. This kit will include the pre-molded heater hoses, when those are released for production (being manufactured now), at which point we will have a price on this kit. A third iteration of the E36 LS1 4-Channel Brake Hard Line Kit - This version is for the 1996-99 non-M versions, the 323 and 328, which we found is different from the 4-channel hard lines for the M3 (fitting sizes at the hydraulic unit are different). We have also revised all of our hard line kits to clear the common air conditioning compressor. Last up in this update are some early pictures of the A/C system we've developed for this swap. This A/C installation isn't 100% complete but the hard parts are done. The 1998-2002 Camaro LS1 A/C compressor is used but the clutch is re-clocked to move the wiring harness away from the E36 frame rail. We add a new drier/accumulator as shown, then make custom lines from the firewall to the compressor, dryer and to the condenser. After we add the proper O-rings and have the system charged it should be good to go, and we will reproduce these parts for production. There is much more than this shown already on turn-key builds we've done here at Vorshlag and we will show more of these parts once they reach production. We will keep working on the E36 swap, striving to offer more parts to make this swap easier and better suited for street use, as well options to build your favorite track terror. Last edited by Fair; 04-09-2014 at 04:47 PM. I'll be in the market for that coolant reservoir when it is avail. E46 - Project Doldrums .. Where is the love .. This "loop" is getting frustrating for E46 customers waiting for new E46 Vorshlag product info.. the blog points to the fragmented format & incomplete "build" thread .. as of this posting not updated for seven months .. the thread points to the blog .. .. how about an organized single point for communicating E46 "timely updates" / status of E46 parts development progress if any? Sorry guys, I am WAY behind in posting updates on E46 LS1 swap parts availability and progress! There are all sorts of sub-system kits and new parts we've developed that are not covered in the build threads just yet. So, yes, please watch our blog and the Vorshlag Facebook page for more timely updates.! I have one of the original Alpha kits, not sure if the headers have changed, but the only complaint I have is the headers hang very low to the point where I have chipped up my garage floor entrance. Now obviously ride height has a little to do with it as well, but figured I'd bring it up to see if it's been changed to addressed. Installing this week. We'll see if we got it right. What's the latest on the remote reservoir? 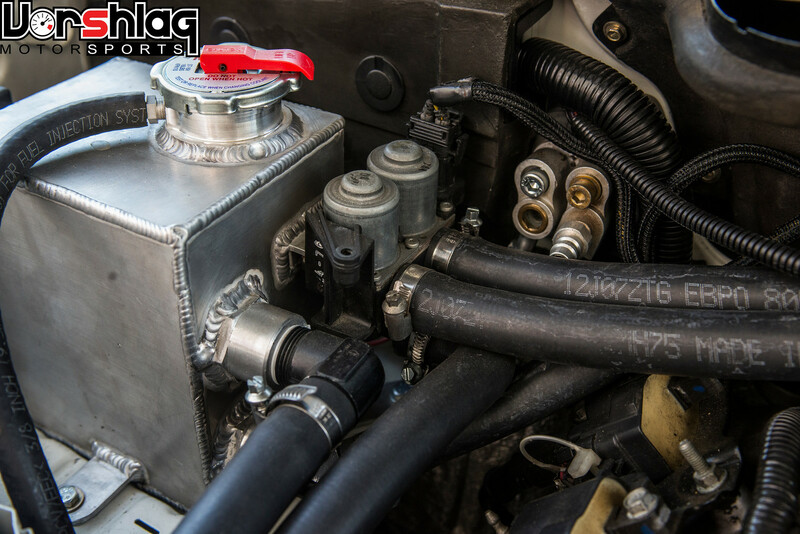 Need a engine harness for your ls1 swap? One Stop Thread For All Your FI Parts!